As a motorcyclist who prefers carving through corners and exploring paths less traveled to cruising at high-speed on major highways, I’m constantly searching for scenic little roads that wind their way toward my destination with fun curves and little traffic. Historically, our navigation tools like highway maps and GPS routing algorithms strive to help people get efficiently from one place to another, and in doing so place an emphasis on the “fastest route”, with the biggest roads and highest speeds. While these are often useful metrics, what they don’t capture easily and certainly don’t highlight is how fun a road might be to ride or drive. I wrote Curvature to builds maps that highlight how fun a road might be — where fun is defined as lots of time spent leaning into curves. I use Curvature as a trip-planning tool for both short rides and multi-week cross-country tours. 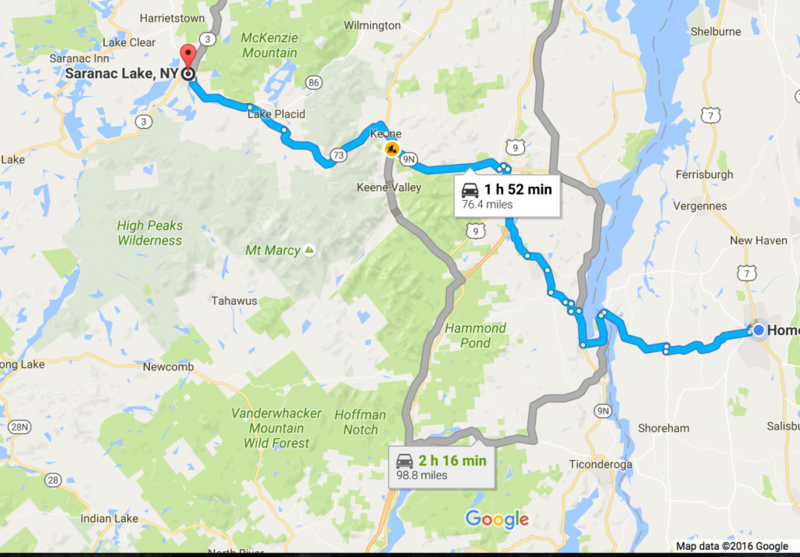 I usually have a general idea of where I want to head — such as an afternoon in the Adirondack mountains to the west of my home which I’ll use in this example. Pulling up a highway map shows the towns and major roads through the region, but it can be tough to see the smaller roads without a lot of zooming in and out. Even big paper highway maps don’t often show the smaller roads — and if they do, their lines are often simplified to show their general path rather than every single curve. 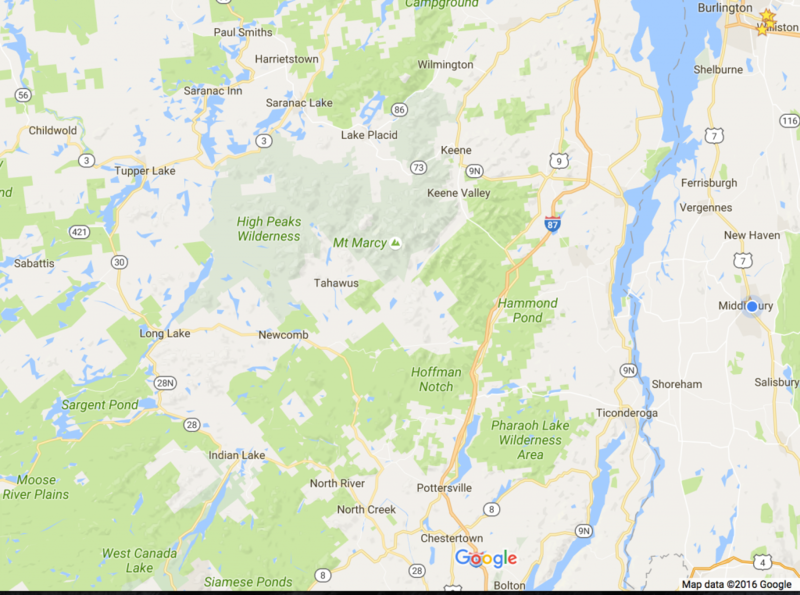 Google Maps view of New York’s Adirondack mountains. It can be tough to see or get a sense of the small roads on maps like this. Were I just to take one of the suggested routes I’ll likely have a pleasant ride (it is a beautiful area after all), but most I’d spend a lot of time cruising along the main roads, which have been carefully graded by highway engineers to minimize turns and maximize speeds. 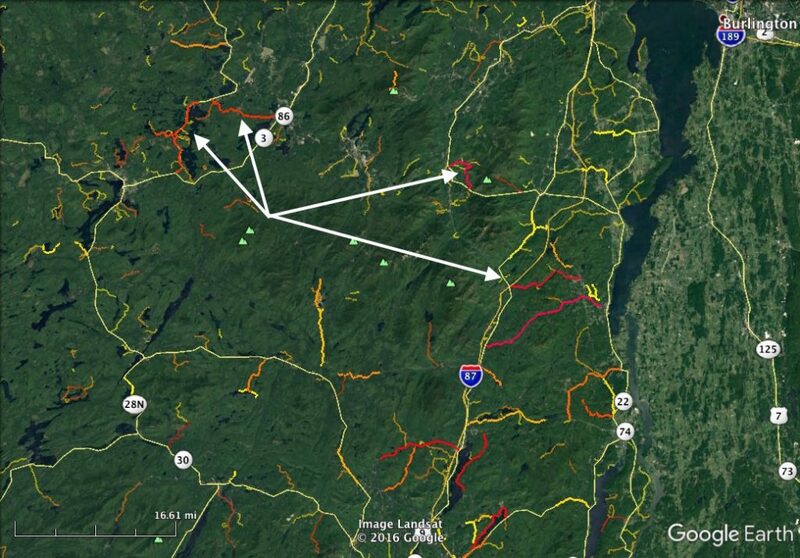 Google Maps’ suggested routes to Saranac Lake. Pulling up the Curvature file for New York State in Google Earth, I can see that there a few smaller roads that are fabulously twisty and happen to generally parallel the most direct route. Curvature highlights the most twisty roads in a color-spectrum from yellow (moderately twisty) to pink (super twisty). Note that the heavier, solid roads are ones that Curvature assumes are paved either because they have explicit surface tags entered in Open Street Map indicating they are paved, or are “primary” or “secondary” roads — which in most of the US and Europe are virtually always paved. The translucent roads are tertiary and smaller roads with no surface tags specified in Open Street Map yet. Based on my experience looking at the data and riding the roads, I’ve found that the the curvature values (a weighted measure of the total length of turns) regularly correlate to how much fun I have riding the road — assuming a good road-surface, low traffic and not too many stop-signs. There might be a few fun corners on these, but these roads are predominantly straight or have long distances between each significant curve. These roads have several significant corners close together. They aren’t likely touring destinations unless you’re stuck with otherwise straight roads in the region, but if you are looking to spice up your commute with a few corners, these might be more fun than the most direct route. This range has a lot of fun roads. They’ll usually have a few dozen corners and generally feel more winding than straight. For much of the world, this range includes the destinations roads that people may ride for hours in order to visit. These roads will usually have long sections of tight turns often for miles on end. In the northeastern US, the best roads are all in this range. These are truly epic roads with mile upon mile of twists and turns. For roads I’m not familiar with, I click on them to see if they have the road surface tagged as paved or asphalt, or if not zoom in on the satellite imagery to make sure they are paved. Curvature filters out roads tagged as unpaved since twisty little unpaved roads tend to be plentiful in many regions and for me the lower speeds make curves less fun. 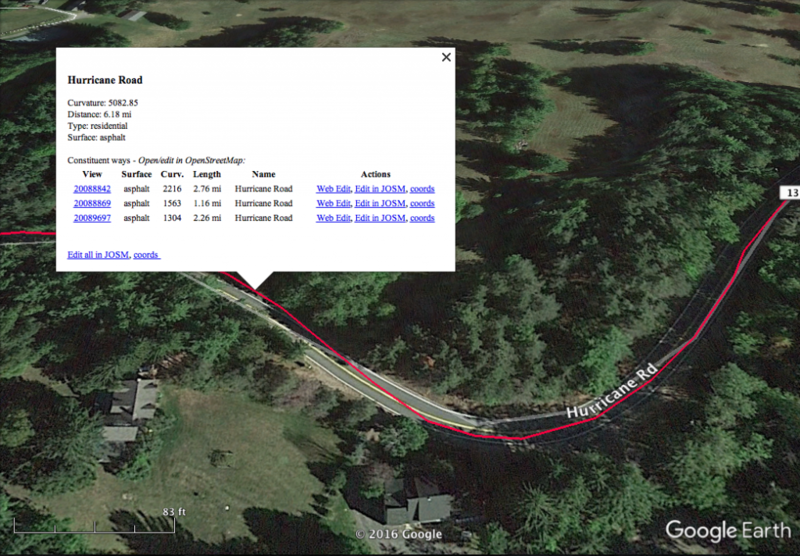 Clicking on a Curvature-highlighted road in Google Earth brings up a detail pop-up with road surface, length details, and links to edit the road in Open Street Map. Once I’ve identified the route I want to take I enter it into my Garmin GPS with sufficient “via-points” to force it to turn me onto my preferred route. If all of this makes sense to you, download the KML files for your region and enjoy. If you’re still a little fuzzy on Google Earth and how to view the maps, continue on to the Step-By-Step page.